SOUP is not available on Mondays. Our award-winning chili is loaded with local artisan tempeh, tomatoes, kidney beans, bell peppers, sweet corn, red onions, and an ultra secret spice blend. Topped with scallions and served with blue corn chips. Add our plant-based house queso or a favorite dressing for $1. Our soup changes everyday, but always tastes great. Served with blue corn chips. Yukon Gold tater tots with 'Bacon' Mayo, Tomato Jam and baby radish greens. Green and black olives, herbs & spices, olive oil. Choice of our plant-based house queso, sassy salsa, or whirled peas. Served with blue corn chips. Our BEST OF ORLANDO creamy hummus is topped with hemp seeds and served with house pickles, fresh veggies, marinated olives, and multi-seed cracker. Organic corn chips topped with our Homemade Hearty Chili, house-made queso, and scallions. Fresh chickpea falafel fritters with a hint of lemon, tomato & cucumber salad, and Green Goddess dressing. Creamy coconut milk yogurt, sliced bananas, curry cashews, and a drizzle of maple syrup. All selections below are made your way in a BOWL or in a whole wheat WRAP with a base of LETTUCE MIX and/or our DANDY GRAIN BLEND (of tricolor quinoa, brown rice, millet, Wehani rice, black Japonica rice and teff). All selections include a choice of SIDE. Garlic-dill potatoes, pickles, arugula, and radish with our tangy Hunny Mustard dressing. Garbanzo beans, tomatoes, cucumber, carrots, bell peppers, celery, and broccoli, topped with scallions and pumpkin seeds, with Green Goddess dressing. Cashew-encrusted tempeh tenders, carrots, celery, and red onions, with Buffalo Sauce and Ranch dressing. Chickpeas, tomato & cucumber salad, mixed olives, herbed cashew feta, sumac onions, bell peppers and Green Goddess. Our famous tempeh chili with crumbled blue corn chips, topped with fresh diced tomatoes and scallions. Served with house-made queso. Add Green Goddess for $1. Chickpea 'tuna' salad with tomatoes, pickled veggies, cucumber, shredded carrots, and BBQ spiced pumpkin seeds. Served with Ranch dressing. Aloha! Bananas, carrots, celery, and cucumber with pecans, coconut, and raisins on top. Served with Curryous Dressing. The bright flavor of our house sauerkraut comes together with cucumbers, mung sprouts, shredded carrots, cashews, and cilantro, with Gingerous dressing. Burritos are made with our nutritious DANDY GRAIN BLEND of tricolor quinoa, brown rice millet, Wehani rice, black Japonica rice and teff. Pressed in a whole wheat wrap. Burritos include a choice of SIDE. Slow-simmered black beans, Dandy grain blend, roasted salsa, sour cream, cabbage pico. Pickled jalapenos on request. Roasted sweet potatoes, Dandy grain blend, pickled yellow onions, pecans, cilantro, and Curryous dressing. Made with local organic Sourdough or Wheat bread fresh from Olde Hearth Bread Company. Includes a side. Marinated portobello with sundried tomato aioli, red onions, tomato and spring mix. Local artisan tempeh 'bacon' slices are layered with local Bibb Lettuce, tomato and Ranch dressing. Our housemade sauerkraut with sriracha 1000 island, Follow Your Heart swiss cheese, and 'corned' eggplant all on fresh Olde Hearth rye bread. The sandwich that is fit for a king. Sunflower butter, carmelized bananas, kettle chips, pickled celery and 'bacon' mayo. Design your very own creation in a BOWL or in a whole wheat WRAP with a base of LETTUCE MIX and/or our DANDY GRAIN BLEND (of tricolor quinoa, brown rice, millet, Wehani rice, black Japonica rice and teff). $6 Standard Menu price includes four ingredients and one dressing. Additional choices are available for additional charge. Sandwiches are made with local organic Sourdough or Wheat bread fresh from Olde Hearth Bread Company and served with a choice of side. Your favorite flavors with a twist! Creamy sunflower butter and house preserves on choice of sourdough or wheat. A classic without the dairy! Plant-based American cheese on choice of sourdough or wheat. Bananas, carrots, and celery with sunflower butter, hummus and currants. $4 Menu Price includes three ingredients and a dressing. Served with our Dandy Grain Blend (of tricolor quinoa, brown rice, millet, Wehani rice, black Japonica rice, teff). Childhood favorite! Sunflower butter-filled celery sticks with raisins and a drizzle of maple syrup. We offer local sustainable honey for enhancing flavor and positive health effects. Make your selection when you pick up your order! Hot or Iced! Locally Roasted from Golden Hills Coffee Roasters. Hot or Iced! 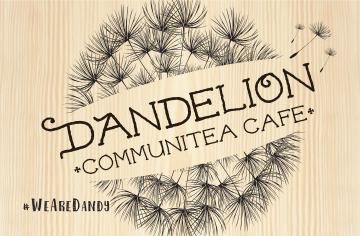 Choose from a wide selections of organic loose-leaf herbal tea blends infused to order. Hot or Iced! Choose from a wide selections of organic loose-leaf tea blends infused to order. 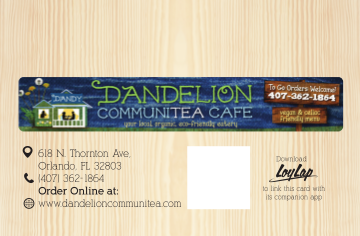 Please indicate if you would like to PICKUP the Gift Card at the Cafe or if you would like us to MAIL the Gift Card. We are happy to mail a gift card anywhere in the US. ALL GIFT CARD ORDERS WILL BE SHIPPED WITHIN 48 HOURS. Please allow 5-7 days for it to arrive via US mail. 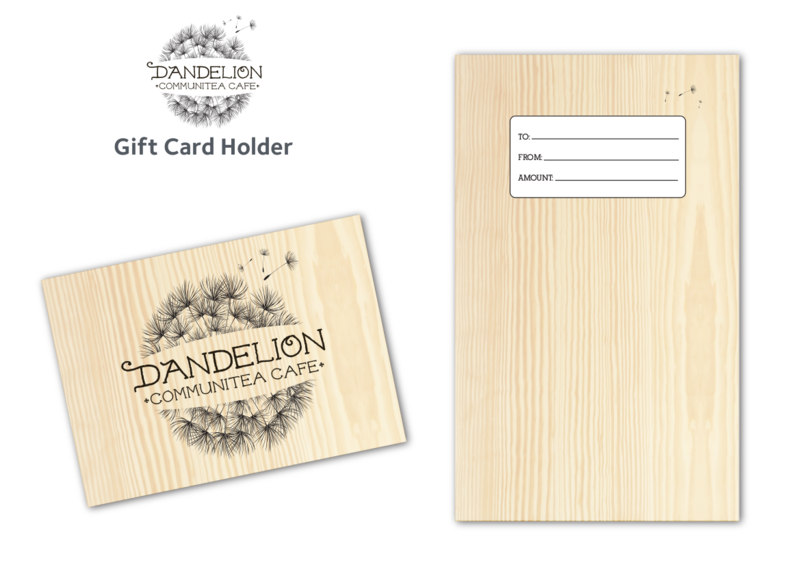 PLUS any note you would like us to include with the gift card.